This great compact mini shovel is a combination of shovel, pick, ice-pick, digging tool and comes with multiple options for adjustment. Also included is a carry case to store this very sturdy and well-built emergency tool. 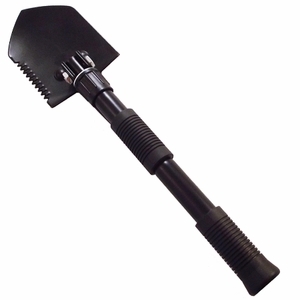 Great for emergency use, hiking, camping, scouting or gardening, this is the most versative mini shovel tool on the market today. Keep it in your emergency kit, in the trunk of your car, use it for hobby or work.